Tour our gallery of boards we have made in the past decade. Returns are accepted on damaged goods only. You must keep all packing materials so a claim can be filed with the shipping company. We reserve the right to issue a partial or full refund or a comparable replacement or a replacement part on any crokinole board in lieu of making repairs. Please remember that this is a handmade product and it will have flaws in the construction and finish. We try to be as perfect as possible, but we are human and perfection is not possible. There are no computer-controlled tools used to make the crokinole boards so minute accuracy and repeatability is not possible. Our crokinole boards are built to the historically accepted specifications. The playing surface is a 26-inch circle with scoring lines at 8, 16 and 24 inch diameters. There are eight brass or nickel plated pegs spaced on the center circle. The center hole is 1 3/8 inches in diameter. The playing surface sits on a 30-inch ditch, which is framed in with rails comprised of several rails (generally three plies). All measurements are nominal; all boards are made individually by hand, and, therefore, there will be flaws. While we try to be perfect, we are human. To this day, we don't incorporate any computer controlled equipment simply because those tools are out of the range of most hobbyists including us. As mentioned before, we build boards as a hobby and have family and work lives outside of the shop. In the past, we regularly built special boards...either handpainted or using wood veneers. These are not available at this time. Also, we do not have licenses to use team, university. business or entertainment logos. But please contact us at crokinoleworld@gmail.com if you have something special you would like. We can do quite a bit of customization. We are currently unable to offer boards like these, but we have great intentions of being able to do so in the future. These are just some of our Premium handpainted and veneer boards from the last decade. All painting was done by Virginia artist Penny Hauffe. Yes, we are building boards all the time. But the vast majority of boards are made for people who place orders. On occasion, we have extra boards and they will show up on this page. If there are none, it means we don't have any extras available. The best way to get a board is to place an order. You can do that by emailing crokinoleworld@gmail.com. If there are boards shown below and you want one of them, contact us via email also. For additional information, please see our Resources page. C R O K I N O L E W O R L D is the website for Hilinski crokinole boards. It's April 2018 and, yes, we're still building boards. We just don't do a lot of web stuff. 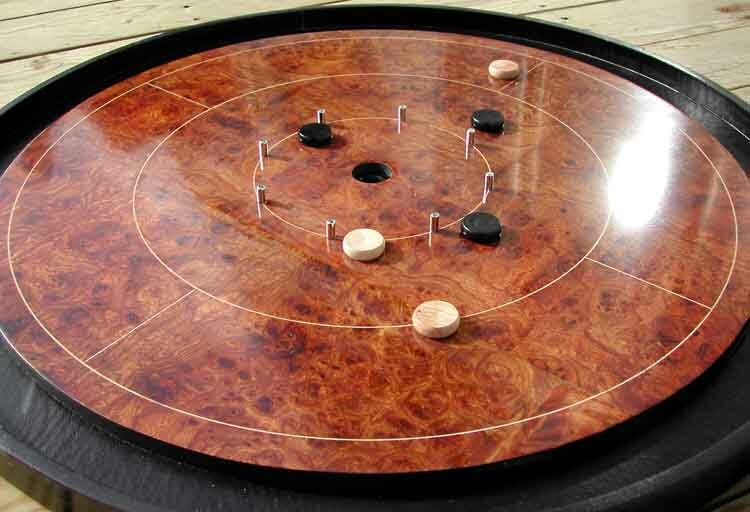 You can contact us by sending an email to crokinoleworld@gmail.com..
Crokinole is a dexterity game invented in the mid-1800s in Canada or northern U.S. It is played on a round board and is a tabletop version of shuffleboard or curling where players slide discs into scoring areas on the board while attempting to knock their opponent's discs into the ditch. We build crokinole boards as a hobby and we focus on building boards. We do not sell extra discs, carrying cases, etc. We recommend if you want additional discs or sets in different colors to contact workshopsupply.com. We buy our discs from them in bulk and if you go there you will be assured that the ones you get will match in weight, density, etc. to those we send. It's very simple. Send us an email and tell us what you'd like us to build for you. Most people look at boards we've built in the past on our Portfolio page and ask us to make something like it for them. We can never promise an exact match because of the nature of wood and stains. To contact us, send an email to crokinoleworld@gmail.com. We will ship boards via standard ground to the original 48 states in the U.S., and this shipping is free. Payment is generally not expected until your board is completed and ready to ship. We accept payment via Paypal or a personal mailed money order from your bank. You can use your credit card at Paypal. Boards are $250 USD and this includes the board, printed rules, 24 discs, disc storage box and free U.S. ground shipping (Alaska, Canada and Hawaii are extra...email us and we'll get you a shipping quote). On rare occasions if you ask us to build something we believe would be difficult to sell because it is so highly specialized, we may ask you for a non-refundable deposit. We now offer specialized design options using a computer controlled router (CNC). An image is downloaded to the CNC, and the machine carves that image into the board surface. Below are some examples of recent CNC projects. Use of licensed material requires the permission of the license holder.